Matthew Stockman/Getty; Jonathan Daniel/GettyKyrie Irving and Jimmy Butler could be the next NBA superstar pairing. Two league sources told Business Insider that there is a growing buzz about Kyrie Irving and Jimmy Butler teaming up next year in free agency. Both sources said the New York Knicks and Brooklyn Nets could be well-positioned to land the two stars. Both teams are expected to have cap space and be free agency players in 2019. Other reports have also linked Irving and Butler as the NBA’s next potential super-team. A year out from what could be an enormous 2019 free agency in the NBA, there are rumours about the next potential super-team. Both sources also said the New York Knicks and Brooklyn Nets could be well-positioned to land the two players if they are indeed keen on teaming up. “It wouldn’t surprise me if either New York team or potentially both New York teams hit it big next summer,” one source said. The Chicago Sun-Times’ Joe Cowley reported in July that Irving and Butler had talks about how to team up. Cowley reported that in the summer of 2017, Butler, then with the Chicago Bulls, told the Bulls front office to try to trade for Irving before Irving officially requested a trade from the Cleveland Cavaliers. The Bulls ended up trading Butler to the Minnesota Timberwolves. ESPN’s Zach Lowe also called the “chatter” about Irving and Butler teaming up “credible” in July. 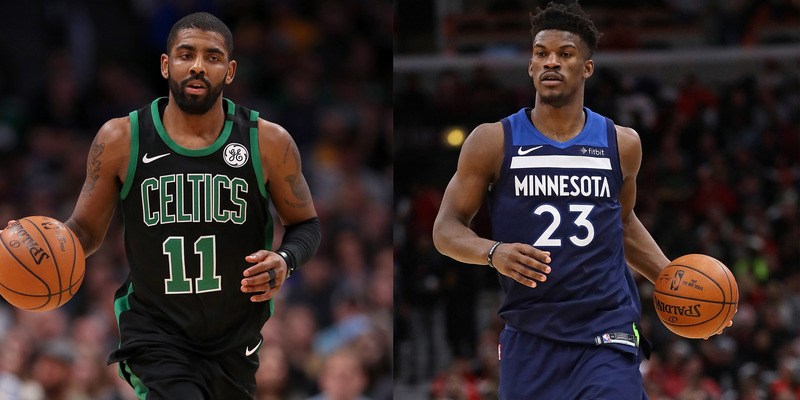 Butler and Irving both have player options for the 2019-20 season but are expected to decline them to become free agents. Irving told reporters in June that he doesn’t plan on signing a contract extension with the Celtics because it doesn’t make financial sense for him. The Knicks and Nets are both slated to have cap space next summer. While the Nets have ample cap room, the Knicks would likely have to make some moves to clear up the cap space necessary to sign two max deals. To make room for two max salaries, the Knicks may have to hold off on an extension for fourth-year big man Kristaps Porzingis until next summer, making Porzingis a restricted free agent at the end of the season. Knicks GM Scott Perry has spoken openly about how the team has been gearing up to be active in free agency next summer. The Knicks have become an increasingly buzzy free agent team in recent months, much like the Los Angeles Lakers were last year. Reports have indicated that the Knicks may also pitch Kevin Durant on signing with them if he hits free agency in 2019 or 2020. It’s unclear if Durant plans to leave the Golden State Warriors, but his insistence on signing two-year deals with opt-outs have raised suspicions in the NBA world. Of course, if Irving and Butler wish to team up, they could also look elsewhere. Irving is in a good spot with the Celtics and hasn’t given any indication that he intends to leave the team now poised to contend for the Eastern Conference. The Celtics also have the assets to pull off a trade for Butler if they wanted to team up. Any number of factors could change the rumours between now and next July, but for now, it seems the 2018-19 season could be dominated by talk of Irving and Butler teaming up.